Common Name : Indian Beech, Poongam Oil Tree, Honge, Ponge. 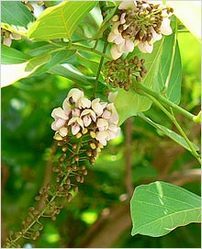 Habitat : Pongamia is widely distributed in tidal and beach forests of india. Uses : Pongamia seeds and oil is anthelmintic, styptic, and depurative. It is useful in rheumatism arthritis, whooping cough, skin alinments and scabies. Seed oil is mainly used in cosmetics, in soap making and as a lubricant. Seed oil is also used as insecticidal, nematicidal and bactericidal. Flowers are useful to quench dipsia in diabetes and for alleviating vata and kapha. Leaves are digestive, laxative and useful in flatulence, dyspepsia, diarrhea, leprosy and cough. Bark is anthelmintic and used in pesticides. Dried leaves are used in stored grains to repel insects. The bark also yields a black gum that is used to treat wounds caused by poisonous fish.